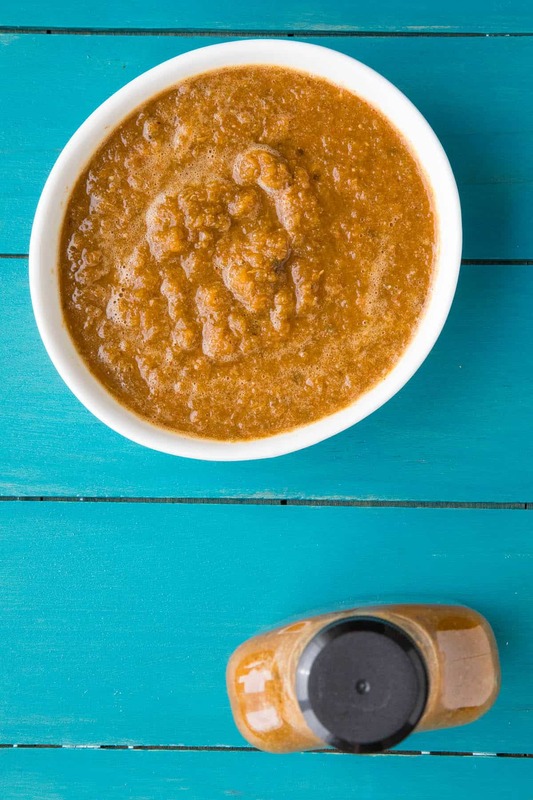 A hot sauce recipe with plenty of zing and smoky flavor, this ancho-jalapeno hot sauce is made with jalapeno peppers, carrots, garlic, ancho powder and more. Drizzle it over anything for extra flavor. More hot sauce coming at you, my friends. If you’re growing jalapeno peppers this year, soon your garden will be EXPLODING with them, so you better get cooking. Not only will you need start thinking about all those jalapeno pepper recipes, as well as ways to preserve your chili peppers, but you’ll also need to start thinking about paying me a visit to give me some of them! What Can I Do With a LOT of Jalapeno Peppers? If you’re stuck for ideas, you can always check this page – 10 Ways to Use a Huge Jalapeno Harvest. But here’s a more direct idea for you. Make HOT SAUCE. 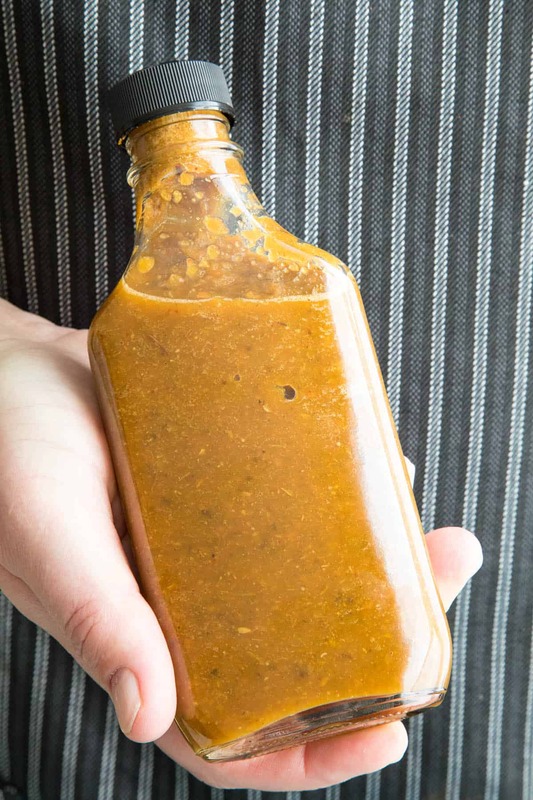 This is a fermented hot sauce recipe and it requires an entire pound of jalapeno peppers, which may not seems like a lot of weight, but it takes quite a few jalapeno peppers to weigh 1 pound. To Ferment or Use Fresh Peppers? If you’re not comfortable with fermenting (you SHOULD be, though), you CAN make this jalapeno hot sauce with fresh jalapeno peppers. Just skip steps 1-4 in the recipe. Start by processing the peppers in a food processor, then jump to step 5 and make your jalapeno hot sauce. 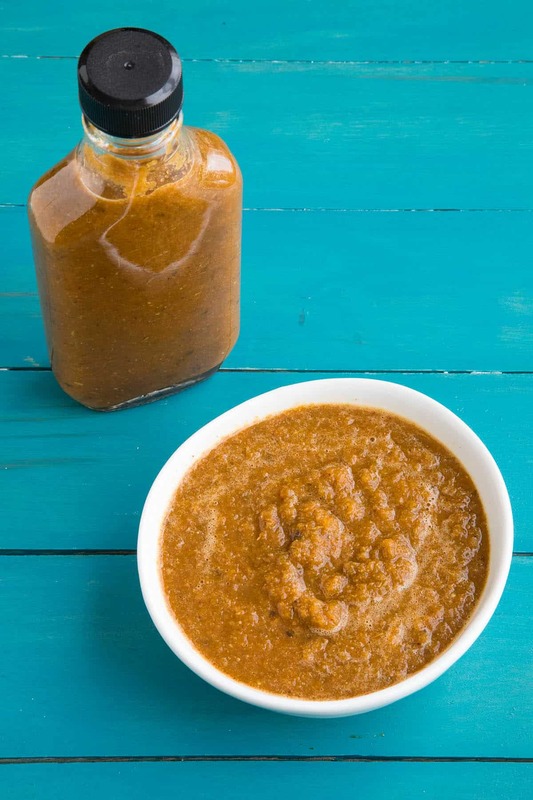 It will still be a good hot sauce, for sure, but you’ll have a fresher, greener flavor that is not quite as developed as you would achieve by fermenting. Check out my page on How to Make Fermented Pepper Mash to learn more about why you should be fermenting chili peppers. Fermented hot sauces are mellower and have a deeper flavor, so I’ve been fermenting a LOT of chili peppers the past several years for making my own hot sauces. I’ve added several other ingredients for flavoring, particularly a portion of ancho chili powder, which gives it a nice level of smokiness and depth. I only used a teaspoon, but you can easily double to triple that to your own personal tastes. 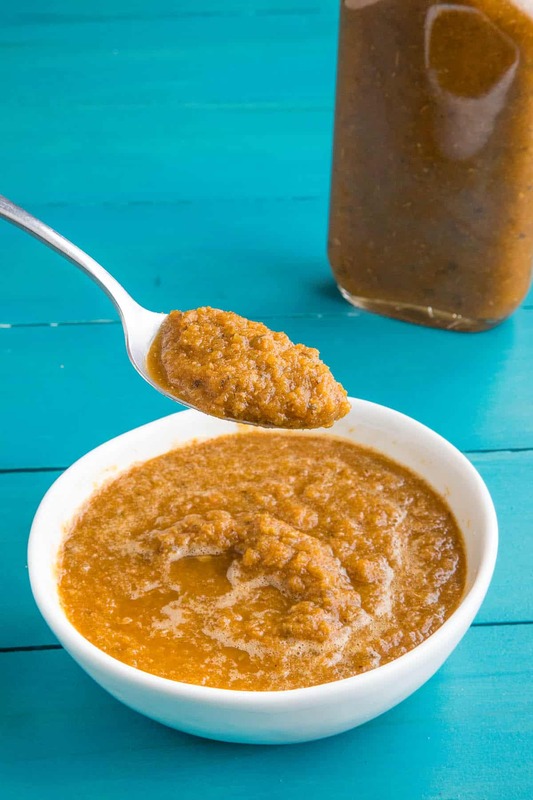 Quick note – After you strain out the solids to thin out the hot sauce, you can throw the solids away, OR — dehydrate them and use them for seasoning. See How to Make Seasonings from Strained Hot Sauce Pulp. Those solids still have plenty of life left in them, and hey, what a great way to make some homemade seasonings for yourself? Sprinkle it over foods or use it as a rub. It would be GREAT on anything grilled. Spice things up a bit! I hope you enjoy the jalapeno hot sauce! Let me know how it turns out for you. I’ve been seeking out fermented foods a lot more since I have IBS. I am looking for any way to incorporate them into my regular eating. Well, guess what? Mike loves making fermented hot sauces. YAY! And problem solved, it’s always in the fridge ready to add to any meal. I love this one more than a lot of other hot sauces. I typically gravitate to the green jalapeno hot sauces regardless, but there is something about this one. It seems to pair with more foods than any other one we have in the fridge. And as you can imagine, we have a LOT of Hot Sauce in our Fridge. First, roughly chop the peppers, carrots and garlic. Pack them into a large jar, leaving at least 1 inch of head space. The mixture may rise a bit when fermenting. Screw on the lid and set the jar away from direct sunlight to ferment for at least 1 week. I fermented for 8 weeks. Ideal temperatures are between 55-75 degrees F. The most active fermentation period is between 1-2 weeks, so be sure to monitor it during this time. “Burp” the jars often by unscrewing the lid a bit to let out some of the accumulating gases. Or, use an airlock or membrane for easier fermenting. See our page, “How to Make Fermented Pepper Mash”, for further instruction. For a NON-FERMENTED Version of This Recipe: Skip the fermenting portion and use fresh jalapeno peppers. Simply add all of the chopped ingredients along with the vinegar to a pot with 1/2-1 cup of water (depending on your preferred consistency), bring to a boil, then simmer 15 minutes. Adjust for salt. Cool, process and store in sterilized jars or bottles. You can strain the sauce if you'd like a thinner sauce before bottling. NOTE: Acidity measured 3.5 after 8 weeks of fermenting and would be low enough for home use and storage. Vinegar brought it down to about 3.0. For the non fermented version. do you still add the vinegar to pot when you boil it? I know it says to add water but I’m guessing the water takes place of the brine from the fermented version. Also, do you strain this sauce? I thought there may be a lot of jalapeno seeds. Thank you. Brandon, yes, add the vinegar with the water and peppers and bring to a boil. You can strain the sauce if you’d like a thinner consistency, or just leave it as is for a thicker sauce. Let me know how it turns out for you. I have made 6-7 hot sauces of this website and I think this is my favorite. I used a mix of jalapeños and red Fresno peppers and it came out with a fair amount of heat . The garlic, carrots, and spices gave it an unique and deep flavor. My go to sauce right now. Awesome, Brandon! Glad you like it! Happy to help. Can’t rate the recipe as I’m just kicking off the fermentation on the mash, but it looks fantastic and I can’t wait. I am considering using a #14 sieve on it so I can retain some texture but make it more “fluid”. I have made a lot of beer and some wine in my time and am curious about if (and if so what) steps you take with respect to cleanliness and/or sanitation. Scrub the chilis/carrots before pureeing them? Sanitizing the jar? Or are we concerned that the lacto and other bugs won’t get a foothold if we do too much of that? Steve, soap and water and good enough with this type of fermentation. I do clean all of my peppers and other fruits/veggies, as well as the equipment I’m working with, but there isn’t the need to sanitize like there is with brewing beer. That reminds me, I need to get on my next batch of beer!